We recently stopped by Krispy Kreme for some of their hot original glazed doughnuts. I asked about their Military Discount program. They said they offered 10% off for Military/Veterans. Awesome! Don't forget every Veterans Day they give away free coffee and a doughnut to Military also! I just went to Krispy Kreme in Kettering Ohio and they don't give the discount. 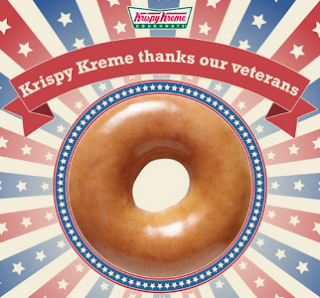 The Krispy Kreme in Florida City gives a 50% discount to military, police and firefighters EVERYDAY! So does the one in Tamarac, FL and Daytona Beach, FL. I just left a Krispy Kreme in Las Vegas and my wingman and I (in uniform) ordered two dozen donuts & two coffees and the woman assisting us didn't even charge us! Great thanks and blessings to you.